informalfigure — A untitled figure. An informalfigure is a figure without a title. Figures often contain mediaobjects, or other large display elements. These elements contain informalfigure: acknowledgements, annotation, answer, appendix, article, bibliodiv, bibliography, bibliolist, blockquote, callout, calloutlist, caption (db.caption), caution, chapter, colophon, constraintdef, cover, dedication, entry, example, figure, footnote, glossary, glossdef, glossdiv, glosslist, important, index, indexdiv, informalexample, informalfigure, itemizedlist, legalnotice, listitem, msgexplan, msgtext, note, orderedlist, para, partintro, preface, procedure, qandadiv, qandaset, question, refsect1, refsect2, refsect3, refsection, refsynopsisdiv, result, revdescription, sect1, sect2, sect3, sect4, sect5, section, setindex, sidebar, simplesect, step, taskprerequisites, taskrelated, tasksummary, td, textobject, th, tip, toc, tocdiv, topic, variablelist, warning. The following elements occur in informalfigure: address, anchor, annotation, bibliolist, blockquote, bridgehead, calloutlist, caption (db.caption), caution, classsynopsis, cmdsynopsis, constraintdef, constructorsynopsis, destructorsynopsis, epigraph, equation, example, fieldsynopsis, figure, formalpara, funcsynopsis, glosslist, important, indexterm (db.indexterm.endofrange), indexterm (db.indexterm.singular), indexterm (db.indexterm.startofrange), info (db.titleforbidden.info), informalequation, informalexample, informalfigure, informaltable (db.cals.informaltable), informaltable (db.html.informaltable), itemizedlist, literallayout, mediaobject, methodsynopsis, msgset, note, orderedlist, para, procedure, productionset, programlisting, programlistingco, qandaset, remark, revhistory, screen, screenco, screenshot, segmentedlist, sidebar, simpara, simplelist, synopsis, table (db.cals.table), table (db.html.table), task, tip, variablelist, warning. Wat Arun, Temple of the Dawn, on the Chao Phraya River in Bangkok, Thailand. 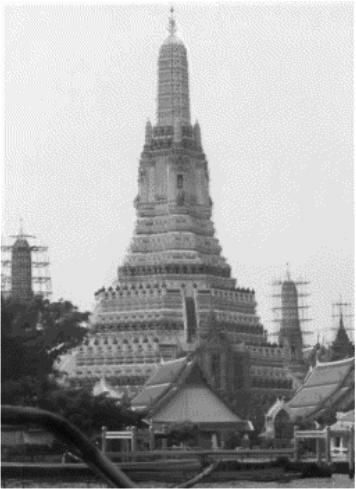 In April 1998, Wat Arun was in the midst of renovation.